Will the tax be raised? Will the tax base be expanded? Will the tax remain revenue neutral? How will equity concerns be addressed? This is not to say that these four criteria are the only relevant ones in carbon tax policy. But I believe they are the most important. First off, the only thing that needs to be said about the Conservative position is that the party opposes the carbon tax and plans to eliminate it in the unlikely event that a Conservative government is formed. A similar policy was adopted by the New Democrats four years ago, which did not end well for them. I can’t see it going any better for the Conservatives. ‘Nuff said. As for the other three parties, let’s start with where they stand on raising the carbon tax. The Liberals — who introduced it back in 2008 at $10 per tonne, raising it incrementally until it reached $30 in 2012 — have now promised to keep the tax frozen at its present rate for five years to allow other jurisdictions a chance to “catch up” to BC’s “leadership.” The NDP’s fiscal plan indicates that the likely next government will be taking roughly the same position. Only the Greens (full disclosure: I’m a party member) are pledging to increase BC’s carbon tax to $50 per tonne and to continue nudging it up from there until it gets the job done. On the subject of the tax base, let’s note that the carbon tax, as currently constituted, applies to only about two-thirds to three-quarters of emissions in the province. Exempt are certain mostly industrial emissions coming from oil, gas, cement, aluminum, and other sectors. The Liberals have announced no plans to change this, while the NDP says it will expand the tax to some areas (such as oil and gas) but not others (such as cement and aluminum), and the Greens promise to tax all greenhouse gas emitting industries. Currently, the carbon tax is required by legislation to be revenue neutral (it’s actually revenue negative, but who’s counting? ), with every dollar coming in going back out in the form of tax credits and cuts to personal and corporate income taxes. The rationale is something along the lines that if people are aware that their tax burden will be no greater (on average) with a carbon tax than without, then they will be more likely to support it because, after all, everybody hates taxes. What the Liberal government did not count on, however, was that many would not be convinced of the carbon tax’s effectiveness unless they saw its revenue being put to productive use. There is a certain poetic justice in the idea of a tax on greenhouse gas emissions being used to pay for public transit and other eco-friendly projects. 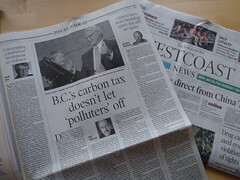 Political optics aside, the best argument for revenue neutrality is that the base for a carbon tax (i.e. greenhouse gas emissions) should be declining over time, assuming that the tax is doing what it was designed to do. Such an unstable revenue source will not provide reliable funding for important government services — green or otherwise — so it is better not to depend on carbon taxes for revenue at all. On the other side, opponents of revenue neutrality might acknowledge that perhaps carbon taxes are not ideal sources of government funding, but we are not exactly spoiled for choice. Not nearly enough is being invested in green initiatives at present, so why not exploit whatever revenue we happen to have at our disposal, regardless of how imperfect it might be? Personally, I consider both these arguments to be about equally convincing (or unconvincing) and find myself in the rare position of being pretty much neutral on revenue neutrality. I support carbon taxation and I support green government spending, but what do I care whether or not funding for the latter comes strictly from the former? I could simply go either way on the issue. BC’s political parties don’t quite see things the same way. The Liberals seem to be holding the line in favour of revenue neutrality (even if their latest budget has altered the tax cuts which were originally part of the revenue neutral deal, but never mind), whereas the New Democrats have long supported investing carbon tax revenue in public transit and other such projects. The Greens, officially, are on the side of revenue neutrality, but they have indicated that they might be open to compromise. Finally, there is the question of equity. Carbon taxes on their own, like all consumption taxes, are well known for being regressive, meaning that on average the poor have to pay a larger percentage of their incomes (although lower absolute amounts) than the rich. For this reason, most fair carbon tax proposals include some kind of mechanism to compensate for this regressive element. BC’s carbon tax includes a low-income tax credit meant to do just that, but unfortunately, a study by the Canadian Centre for Policy Alternatives shows that the current program does not go nearly far enough and that our carbon tax is still, on balance, regressive. I have not heard the Liberals or the NDP say anything about changing this. The Greens meanwhile have promised to “exempt” (whatever that means) people below the low-income cut-off from the carbon tax. The lack of detail on offer from parties across the spectrum suggests to me that the issue of equity is not being treated as seriously by opinion makers as it deserves to be. Note, these grades reflect the parties’ carbon tax proposals only. Carbon taxation is not the sole dimension of a comprehensive climate policy, but it is an incredibly important piece of the puzzle. I find it encouraging to see three of the four major provincial parties openly embracing an idea which is still considered taboo on the federal level. That being said, it would be even more encouraging if they would step up their game. Climate change is the key challenge of our generation, and a well-designed, progressive carbon tax ought to be considered part of any reasonable set of solutions. So hop to it, BC parties! The stakes are high and time is short. This entry was posted in BC Politics, Environment and tagged carbon tax, climate change, Conservative Party, global warming, Green Party, Liberal Party, NDP, revenue neutral by David Taub Bancroft. Bookmark the permalink.